Enjoying Shingeki no Kyojin doesn’t mean you have to adore its various spin-offs. I watched the live-action movies recently, and can’t say I enjoyed them very much despite impressive visuals. The manga version of this gag spin-off also hasn’t been received too well, though I haven’t actually read it myself. But fully accepting it’s just a silly bit of comedy fanservice, I thoroughly enjoyed Chiugakkou. I tuned in for the first episode and the new premise amused me quite a bit – exaggerated, silly versions of our main characters are attending a school split between humans and titans. Eren’s grudge comes not from personal loss but because his lunch was stolen and eaten. In fact, that’s what the nefarious titans do here – invade the school grounds of the poor defenceless humans and steal their bento. 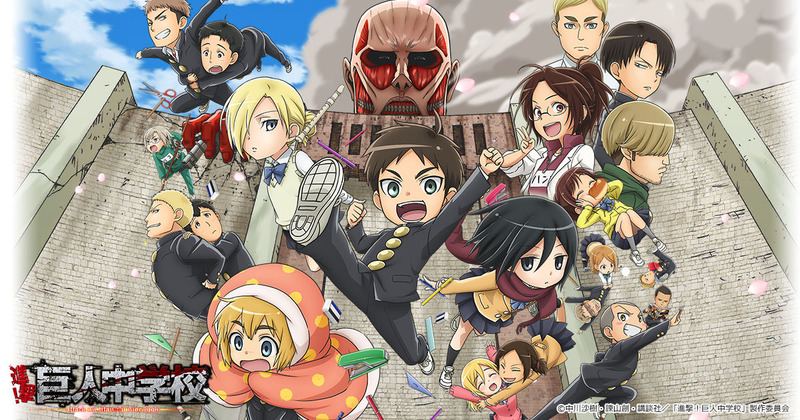 It’s silly and fun and I really like the characters rendered in such cutesy styles, especially Eren and Armin. Character traits are amplified in the ways fandoms enjoy. Levi is an authoritarian upperclassman obsessed with cleaning and rules. Mikasa’s skills are superhuman and her devotion to an oblivious Eren boundless. Armin for some reason is extremely susceptible to the cold and needs to go everywhere wrapped in his futon. The 12-episode season treads the usual ground for school comedies. The kids take part in sports days and go to a matsuri, where romance is in the air. There are mix-ups with love letters and fierce competition to be student president. It’s silly, innocuous stuff and much of the humour comes from seeing these characters who are usually in such a serious and grim setting transposed to one that’s so light and fluffy. I’d say it works better than it ever did for Full Metal Panic! I’m not saying this is a superb anime or one to recommend highly. It’s cheaply-done, unoriginal and the laughs aren’t on a par with the likes of Azumanga Daioh or Nichijou. It’s very much a by-the-numbers comedy spin-off that plays it safe and follows a formula. But that’s all I wanted from it, and it certainly succeeded.